Green cocktails are simply too much fun! They're perfect for celebrating St. Patrick's Day, that's true, but they also fit any special occasion that has a green theme. Beyond the exotic allure of these drinks, you'll find a myriad of flavors, from mint to melon, and plenty of fresh herbs and fruits. Each green recipe is a new experience and there's sure to be one here that's the perfect match for your party. Filled with green ingredients, the Sparkling Shamrock is one of the tastiest drinks you will find, though the final drink isn't actually green. It's also one that almost everyone will love. It all begins with pear vodka and elderflower liqueur. To that, cucumber, mint, lemonade, and soda are added. 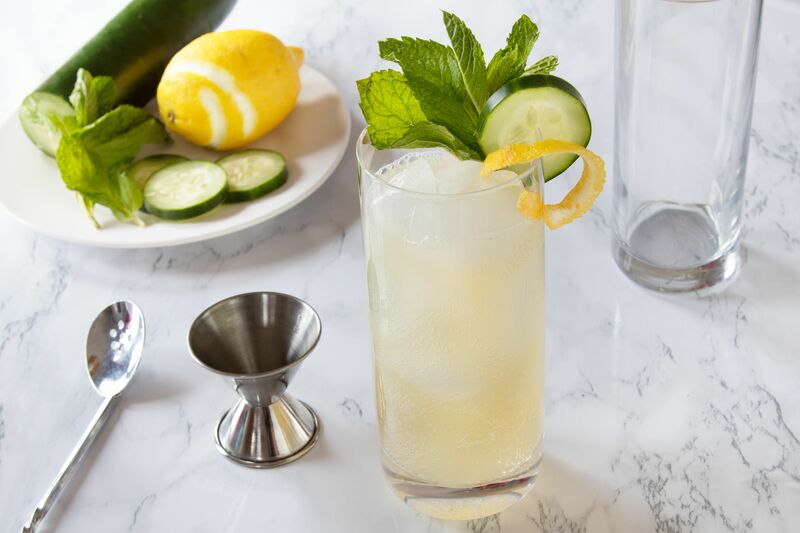 It's very easy and the result is a tall, refreshing drink that's a perfect way to kick off your St. Patrick's Day party. When you want to get a little spicy, turn to that signature green paste we know and love as wasabi. If you've been reserving it for your sushi, you'll be amazed what it can do in a beverage. In the Cucumber Wasabi Martini, the spicy paste is offset by the cool taste of fresh cucumber. It's a surprisingly pleasant combination and when it's backed by a high-end gin as well as hints of sweet and sour, a truly impressive cocktail is born. It's possible that the Grasshopper was the first truly popular green cocktail. It's been around for years and it still holds a magical appeal, with a flavor that is simply too delicious to pass up. This modern classic is a creamy martini with a mint-chocolate taste. 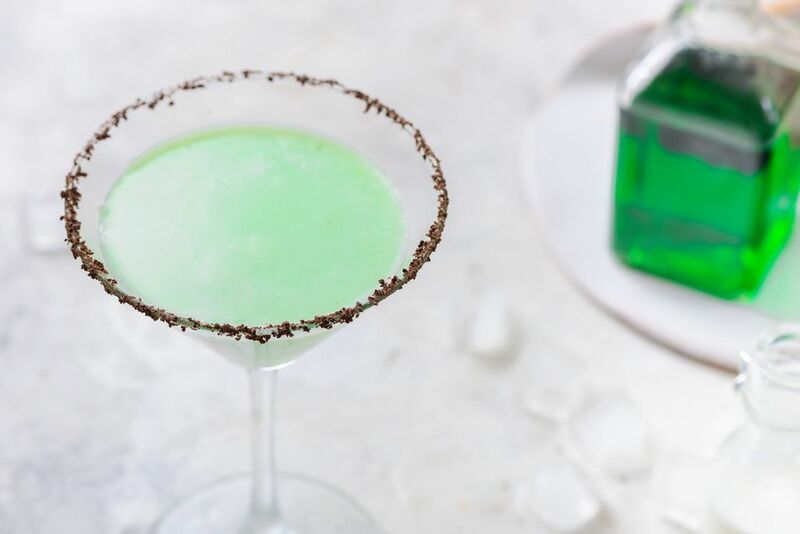 The recipe requires three ingredients, just be sure you pick up white crème de cacao and green crème de menthe or your drink will not have that signature green look. It's so simple, so satisfying, and it's green! What more could you want on St. Patrick's Day? If you're looking for a little whiskey, you'll find it in the Irish Eyes as well. This creamy lowball is wonderful in its simplicity and requires just three ingredients. You'll want green crème de menthe, along with your favorite Irish whiskey. Give that pairing a cream background and enjoy this green delight. A simple little twist can transform the popular sour appletini into what is arguably a better tasting cocktail. This one just happens to follow our Irish theme as well. The Green Dublin Apple Cocktail opts for Irish whiskey over vodka and specifies white cranberry juice. This allows the green apple schnapps to take over the drink's color, creating a brilliant green beverage. The sweet cranberry may also be what appletinis have been missing all along. If you're in the mood for an ice-cold glass of tea, it may be a good day for an Irish tea party. This is no stuffy party, either. No, this one's filled with Irish spirit. As you might suspect, we'll be turning to Irish whiskey for this recipe. It's the perfect foundation for freshly brewed, sweetened green tea. The drink gets a real lift with an absinthe rinse that coats the glass, leaving its signature taste behind. Admittedly, this green-tini will not be to everyone's liking. Yet, if you have that special palate that can appreciate its unique flavor, it is a wonderful delight! The Emerald Isle is extremely simple. The recipe is nothing more than a mix of gin and green crème de menthe, accented with a dash of bitters. Give it a try before you judge it. Who knows, it may be your new favorite. While it may not be the first thing that comes to mind, there's always room for tequila in the St. Patrick's Day scene. If you're looking for something unique for the party, the Shamrocker is the way to go. This recipe is quite fun and little more than a green margarita. The color and main flavor come from a melon liqueur, and triple sec and orange juice play a fruity backup. There may not be an Irish ingredient, but in no way does it lack spirit. Green crème de menthe is a common element in many green cocktails and the Irish Pride celebrates it. This is not your average minty drink, though. In this simple recipe, you will mix the green mint liqueur with amaretto. While that sounds normal enough, a healthy dose of lemon juice is added to give it a bold sour kick. It's interesting and worth trying. We cannot talk about a St. Patrick's Day party without including a round of shots. One very fun recipe also fits our green theme and it can fit both fancy and casual parties. The Guinness & Green includes two fun layers of flavored gelatin. On the bottom, you have a deep brown stout and Irish whiskey gelatin. That is topped with a sweeter, lighter Irish cream gelatin that's been dyed green. It's a joy to make and "drink" and the flavor is quite surprising.